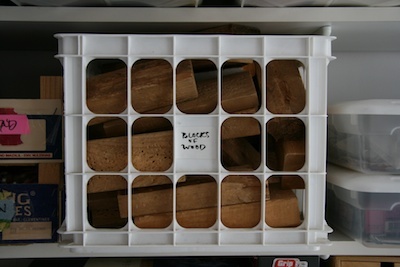 One section of the studio is storage for workshop materials. I use blocks of wood when I do Japanese bindings—one block goes under the book to protect the table and the other is used as a hammer. It works well and I think it is a little safer than a hammer. It doesn't hurt quite as much if you miss and hit your finger. In a workshop, the sets of blocks are shared by two or three kids. Each one gets a sewing kit. This Summer I've been teaching a friends 2 girls how to make books. I made them each one of these kits. Fantastic Idea! They love the idea of recycling paper and boxes into books. I haven't seen your Japanese bindings. Are they on You Tube? Japanese bindings not on youtube yet. Am not sure when. 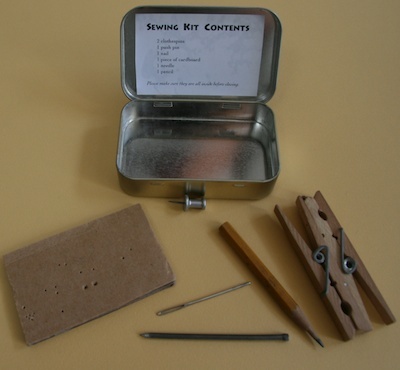 A portable book binding kit - how ingenious!